A Digital India initiative running on community backup since 2009 - Robolab Technologies Pvt. 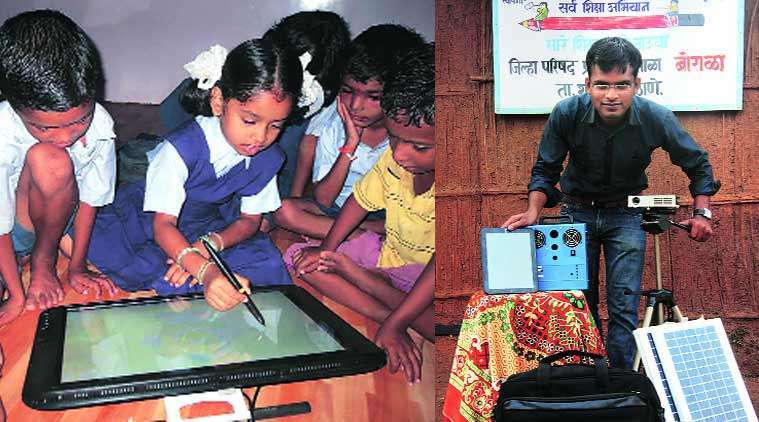 Ltd.
Much before Prime Minister Narendra Modi rolled out his government’s plan to digitally connect India, a school teacher in a tribal hamlet in Maharashtra had already set about on his own ‘Digital India mission’ — one that involves transforming the country’s rural schools into e-learning smart hubs where old-fashioned textbooks will make way for tablets and touchscreens will replace blackboards. And unlike the Centre’s big plan, which is pinning hopes on the industry sector for investment, this unsung hero’s dream initiative is almost entirely community-driven. For Sandeep Gund, 29, who teaches in a state-run Zilla Parishad (ZP) school in Thane’s Pashtepada, the journey that had begun as an idea in 2009 has now manifested itself into a “mass movement”. “Over 1,000 rural schools spread across 19 districts in Maharashtra have so far opted for the digital makeover,” says Gund. It has finally also caught the attention of the Maharashtra government, which has decided to replicate the e-learning model across all its 67,000 ZP schools. “We plan to kick off the project this year itself. One tablet computer with in-built education applications and a projector would be provided, to begin with. The tender for this is already in the works,” says Principal Secretary, School Education, Nand Kumar. Gund claims that Assam and Gujarat governments too have shown interest in adopting his model. In fact, the Indian Institute of Management, Ahmedabad, has even taken up the initiative as a case study. It all began in August 2009, when Gund, then 24, was posted as a primary school teacher in the hamlet. “The first few days were almost a nightmare. Most students never turned up. I even felt like leaving the job and returning to my native place (in North Maharashtra),” he recalls. Just about then, the idea was born. “Students were bunking school to watch movies on a television set in the local Patil’s (sarpanch) home. It was the only house in the village with a TV. They even skipped lunch and remained glued to the TV set,” Gund says. Deciding to experiment with the students’ fondness for the screen, Gund managed to get a local NGO donate a personal computer to the school. “First, we experimented with animated stories, poems and educational games. Once the idea caught on and students began showing interest, we started adding further educational content. We even compared traditional teaching methods with digital learning, and found the latter worked wonders with students,” he explains. Fellow schoolteacher Pandharinath Dongre and education centre head Mahindra Dhimte joined hands with Gund in unlearning the traditional teaching method. “A major breakthrough came when our digital learning project received an award by the state’s Council of Educational Research and Training. From the cash prize, we purchased a touchscreen that replaced the school’s blackboard in a bid to make the learning experience more interactive. It was the students’ keenness that kept us going, which coincided with our experiments that clearly showed that the e-learning initiative was a hit with students,” Gund says. It was about that time when the trio thought the 20 students of the school should be provided with a tablet each.But finances were a problem. Gund and his associates then pitched the idea to local villagers. “We first donated Rs 5,000 each from our salaries and explained the plan to villagers. A woman walked up to me and said she did not understand what I was saying, but would give Rs 1,000 as it seemed good for her child. Other villagers followed the cue. Those who could not donate money offered to help with school work,” he recalls. “First we purchased one tablet PC and a projector. Textbook lessons were gradually converted into PDF files and projected on the touchscreen,” adds Gund. While persistent load-shedding and power cuts were a spoiler, social media came to the rescue. “A Pune woman donated a social media kit to the school after we blogged about it,” he recalls. The trio also kept elected representatives and villagers in the loop for resources needed for further upgrades. Now, all schoolchildren in Pashtepada have a tablet PC. Teaching is almost entirely digital. “Students are only asked to do homework in notebooks to ensure they have adequate writing practice. After all, exams are yet to go digital,” Gund remarks. “We have also downloaded 200 applications from Google Play Store, and are now developing a customised application ‘Ausadh’ (Medicine) that aims to make education schoolbag-free,” he adds. While the students are not yet allowed to take the tablets home, Gund says that is going to be the next step. It was not long before the initiative caught the attention of nearby villages. “They began visiting the school. A nearby village donated Rs 90,000 the residents had collected for its annual religious festival for replication of the model in the village school. What began with a tribal school has now extended to 1,000 schools across Maharashtra,” says Gund. His team has now even developed low-voltage projectors that can be run using a portable solar kit to overcome the power-cut problem in rural belts. “These villages are now solar smart,” he says. Nand Kumar, meanwhile, says the state government too has plans to encourage “community participation” as it plans to expand the initiative to other ZP schools. Gund now also holds free e-learning workshops for teachers and parents across the country.